Hi from the Big Sky Country - The BBQ BRETHREN FORUMS. I have been using an old electric smoker (plug and go) for 20 years and it has finally rusted out. I am a retired airline pilot and love to cook - although my specialty is creole/cajun I do love to bbq. Montana suffers from a real lack of quality hardwood so I must confess to having used a propane Weber for a long time. I know it is not the same but it is bad enough having to haul andouille and boudin up from Louisiana without having to haul wood as well. I would like to be able to cook/smoke for 50 people as I do some light catering. Anyway, nice to meet everyone...this forum looks like a wealth of information and friendly people. Hey Dale! Glad you found the forum! 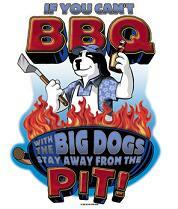 It is about the best source of info you could have stumbled onto... not just about BBQ either! Welcome Dale. Sounds to me you might want to check out the Pellet Pooper smokers (FEC and Trager). Welcome aboard Dale!! Plenty of fantastic info here. Enjoy!! Last edited by Sledneck; 05-21-2008 at 08:54 AM.. Welcome, now pull up a stump and take a load off!!! Normally I would argue against a pooper... But in this case it sounds like it makes sense. Welcome to the greatest forum on the planet Dale. I would love to know more about Cajun type dishes.